Kanazawa Castle (金沢城) is the main feature of Kanazawa. It was built in 1583 by Maeda Toshiie one of the Sengoku Heros. During Edo period, Kanazawa Castle was the residence of Maeda clan, the lord of Kaga Domain. The great keeps, walls and gates are reconstructed in 2001. Most of the stone walls remain in the original structures, and Ishikawa mon Gate is one of remaining building which built in 1788. There was a university on the castle for long time, but they are moved to other place in 1995 and entire area of the castle was restored as the castle and its garden. The admission for Keeps: 300 Yen, 100 for kids. The history of Kanazawa Castle gets back to 1546 when Honganji Temple was built in this place. During Sengoku Period, it was the capital of Hokuriku Honganji Temple. When Oda Nobunaga defeated Honganji in 1580 and made a pack with them, he ordered Sakuma Morimasa to build a castle at this place. After the battle of Shizukadake, Sakuma fought against Toyotomi Hideyoshi, and lost the battle. Sakuma lost this land of Kaga, and it was given to Maeda Toshiie. 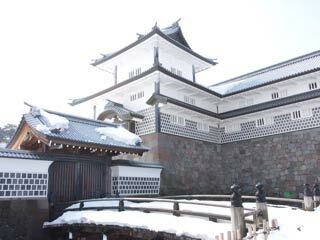 Maeda Toshiie started building stronger castle since 1592. He extended the baileys and moats, and built 5 stories Tenshu-kaku. Since then, Maeda clan ruled Kaga Domain though Edo Period. After the Meiji Restoration, it became a part of military base until the end of WWII, then after the war, it became the campus of Kanazawa University. In 1995, Kanazawa University was moved to othe place, and the City of Kanazawa and Ishikawa Prefecture started to restore the castle. In 2001, the several keeps and gate were reconstructed and opened as a castle park. Higashi Yagura (east keep), Gojikken Nagaya (store house), Hashizume mon Tsuzuk Yagura (gate with keep) There were all restored in July 2001. They form the largest wooden castle structure in Japan that was built since Meiji period. It is well worth a visit to see the buildings that have been restored using the traditional wooden frame construction method, as well as various models on display. The present Isikawa mon Gate, which has been designated as a National Important Cultural Property, was built in 1788. It is the backside gate of the castle, and of the type of referring "Masugata mon," or box-shaped gateway. Night-time, light-up gives it a particularly magical appearance. This building , which has two-story, has been designated as a National Important Cultural Property, as well as Ishikawa mon Gate. It was built in 1858, and its present length is approximately 48m wide. Kahoku mon Gate has a masugata shape and it essentially functioned as the main gate of the castle. Moreover, its secondary gate is the biggest gate of the castle. This gate was reconstructed in 2010. Inside of the gate's keep is open public. Most of the stone walls and moat remain since they were built. Stone walls of Ishikawa mon Gate was built in 1765. The stone walls of the inner moat was built in 1631. Wood and earth are the basic materials of castle construction, but they are not strong against the rain and wind. Therefore, the outside of the castle building is covered with copper or lead panels, and plaster and tiles are attached on the surface of earthen walls. As long as it is not exposed to rain and wind, the construction will not be damaged or rot. This is another traditional technique in castle construction.